Transparency Market Research has published a new report titled, “Global Automotive Tailgate Market [Tailgate Type: Hydraulic Operated, Power Operated, and Manual; Vehicle Type: Passenger Vehicle and Commercial Vehicle, Material: Metal, Plastic, and Others, Sales Channel: OEMs and Aftermarket] - Global Industry Analysis, Size, Share, Growth, Trends, and Forecast, 2019–2027.” According to the report, the global automotive tailgate market is projected to surpass US$ 15 Bn by 2027, expanding at a CAGR of above 4% during the forecast period. According to the report, the global automotive tailgate market is likely to be driven by a range of macroeconomic and industry-specific factors. Asia Pacific is expected to be at the forefront of global demand, with the market in the region expanding at a CAGR of more than 4% between 2019 and 2027. Automotive tailgate, also referred to as tailboard, is the rearmost door, or hinged board, or door at the rear end of the vehicle, which moves upwards or downwards for the duration of loading and unloading and offers access to the cargo area of the vehicle. Automotive tailgate is the closing door of the boot compartment in the vehicle, especially in a passenger car, which is either fully hydraulic operated or power operated or manually operated. Automotive tailgates are quite frequently employed in passenger cars, UVs, and pickup trucks. Rise in production of exotic and luxury cars is likely to boost the automotive tailgate market. Luxury car manufacturers incorporate various designs to showcase the elegant appearance and style of the rear-end of the vehicle. This attracts the young generation owing to its enhanced appearance, comfort, and speed. Increased passenger vehicle production owing to reduction in vehicle loan interest rates, easy availability of finance with customized financial schemes offered by banks, OEMs, and car dealers, and increase in per capita income are likely to propel the automotive tailgate market during the forecast period. Increased demand for luxury vehicles, raised preference for electronically advanced vehicles, and increased adoption of advanced safety technologies and vehicle enrichment accessories are likely to propel the automotive tailgate market. Expansion of the construction industry is anticipated fuel the demand for commercial vehicles, which in turn is likely to propel the automotive tailgate market during the forecast period. In terms of type, the global automotive tailgate market has been divided into hydraulic operated, power operated, and manual. Power operated tailgate utilizes the tailgate drive, which is compact in size and is capable of handling heavy tailgates. Furthermore, the power operated tailgate creates less noise and is light weight. Focus of auto manufacturers on efficient components along with the demand for light weight vehicles are estimated to drive the power operated tailgate segment at a significant CAGR during the forecast period. Demand for high-end vehicle models and luxury class vehicles is rising in developing countries, owing to a rise in per capita income and improved infrastructure, which in turn likely to propel the demand for power operated tailgate during the forecast period. Based on material, the automotive tailgate market has been divided into plastic, metal, and others. Companies such as Plastic Ominum and Magna International offer composite material tailgates for major auto manufacturers such as Citroen C4, Range Rover, and Peugeot. Furthermore, the composite tailgate, reinforced with carbon fiber, reduces the overall weight of the tailgate and hence, the demand for plastic automotive tailgate is likely to increase during the forecast period. Demand for light weight and high strength materials is likely to increase the usage of plastic in tailgate manufacturing during the forecast period. In terms of sales channel, the automotive tailgate market has been classified into OEM and aftermarket. Vehicle manufacturers provide the tailgate system in their vehicles as a standard accessory or as an option owing to the demand from consumers. Consequently, the OEM segment dominated the market. Less road fatalities and high lifespan of tailgate are likely to hamper the aftermarket segment during the forecast period. However, rise in vehicle production, particularly in passenger vehicles, is likely to boost the automotive tailgate market during the forecast period. In terms of region, the global automotive tailgate market has been segregated into North America, Europe, Asia Pacific, Middle East & Africa, and Latin America. 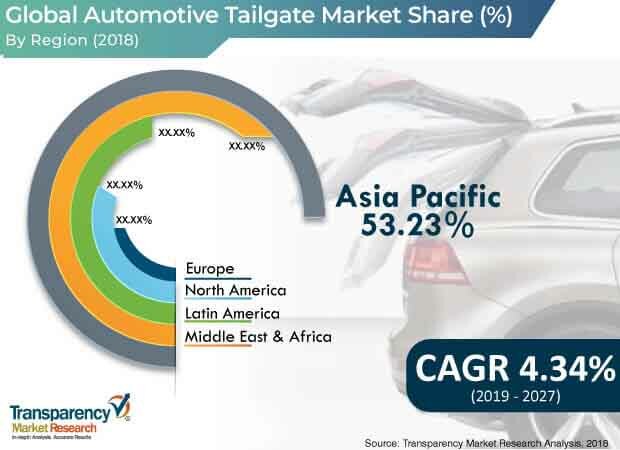 Asia Pacific dominated the global automotive tailgate market, as vehicle production in Asia Pacific is high due to the presence of major automotive hubs such as India, China, and South Korea in the region. Prominent players operating in the global automotive tailgate market include Magna International Inc., Faurecia, Robert Bosch GmBH, Plastic Omnium, SEOYON E-HWA Automotive Slovakia, Rockland Manufacturing Company, Zhejiang Yuanchi Holding Group Co.,Ltd., Huf Hülsbeck & Fürst GmbH & Co. KG, Woodbine Manufacturing Co. Inc. and Go Industries, Inc., and GORDON AUTO BODY PARTS CO., LTD.